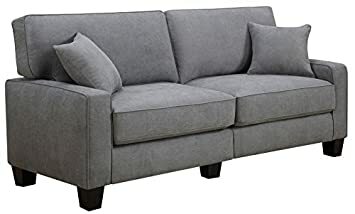 Designed for small living spaces, the Serta Copenhagen Collection 78″ Sofa brings functional style and affordable comfort to your home decor. A great fit for apartments, dorms and narrow spaces, its compact size and unique, tool-free design make it easy to transport and to set up exactly where you want it. In addition to making small spaces feel bigger, the soft rounded arms, refined straight back cushions and reversible accent pillows add traditional style to your living room, den or extra room. 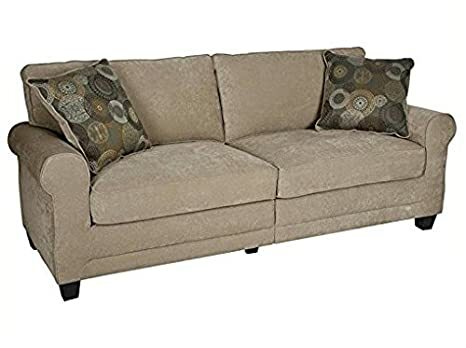 Reinforced hardwood materials, individually wrapped coils surrounded by high-density foam and poly-fibers, and pillowed back cushions deliver durability you can count on and supportive comfort you can relax into. 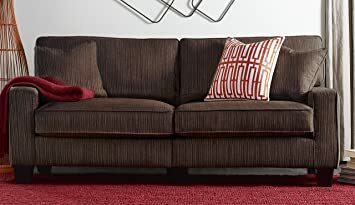 Match this Serta sofa with a Copenhagen Collection sofa, loveseat and accent chair for a completely coordinated look. 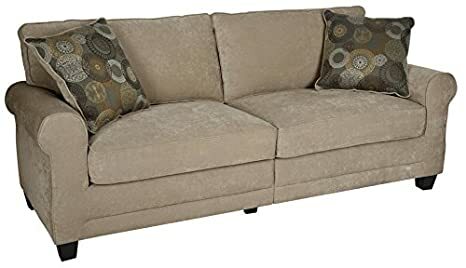 Created to suit small living spaces, the Serta Palisades Collection 60″ Loveseat brings functional style and affordable comfort to your home decor. Its compact size and unique, tool-free assembly make it a great seating solution for apartments, offices and dorms. In addition to making small spaces feel larger, its straight arms, trendy fabrics and square espresso footers brings a modern flair to your living room, guestroom or home office. Quality hardwood materials deliver strength and stability while individually wrapped coils and pillowed back cushions offer a cozy, supportive seating you can relax back into. 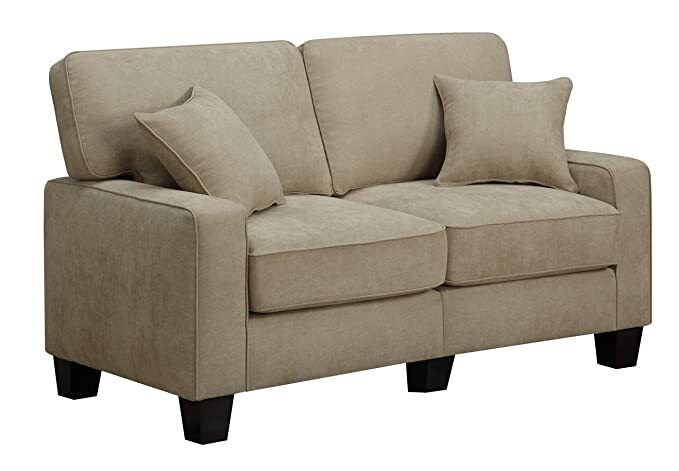 Designed to match pieces in the Palisades Collection, this Serta loveseat can be combined with another sofa, loveseat and accent chair for a completely coordinated look. 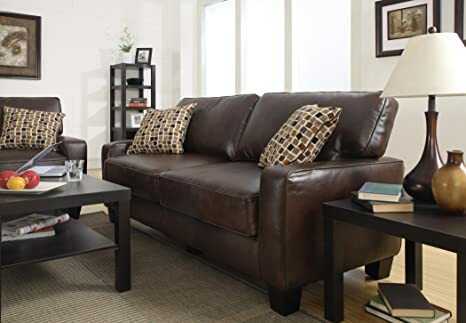 Designed for small living spaces, the Serta Copenhagen Collection 61″ Loveseat brings functional style and affordable comfort to your home decor. A great fit for apartments, dorms and narrow spaces, its compact size and unique, tool-free design make it easy to transport and to set up exactly where you want it. In addition to making small spaces feel bigger, the soft rounded arms, refined straight back cushions and reversible accent pillows add traditional style to your living room, den or extra room. 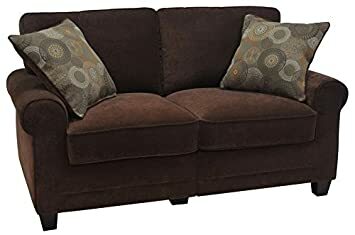 Reinforced hardwood materials, individually wrapped coils surrounded by high-density foam and poly-fibers, and pillowed back cushions deliver durability you can count on and supportive comfort you can relax into. 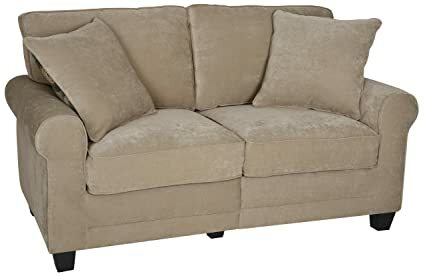 Match this Serta loveseat with another Copenhagen Collection sofa, loveseat and accent chair for a completely coordinated look. 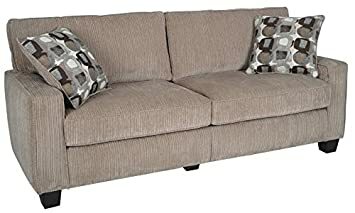 Created to suit small living spaces, the Serta Palisades Collection 72″ Sofa brings functional style and affordable comfort to your home decor. Its compact size and unique, tool-free assembly make it a great seating solution for apartments, offices and dorms. In addition to making small spaces feel larger, its straight arms, trendy fabrics and square espresso footers brings a modern flair to your living room, guestroom or home office. Quality hardwood materials deliver strength and stability while individually wrapped coils and pillowed back cushions offer a cozy, supportive seating you can relax back into. 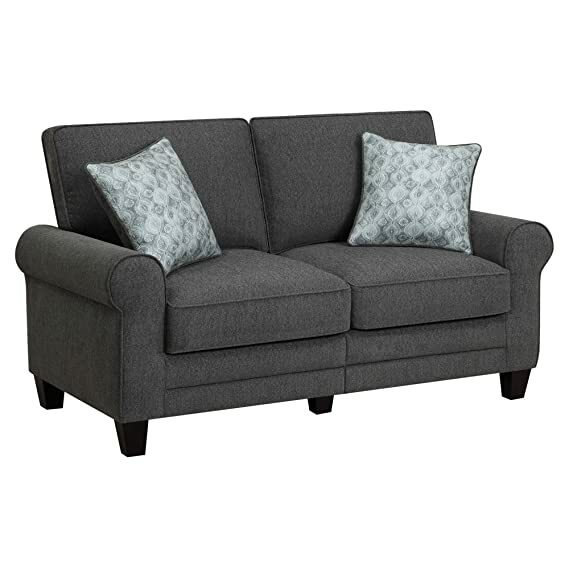 Designed to match pieces in the Palisades Collection, this Serta loveseat can be combined with another sofa, loveseat and accent chair for a completely coordinated look. 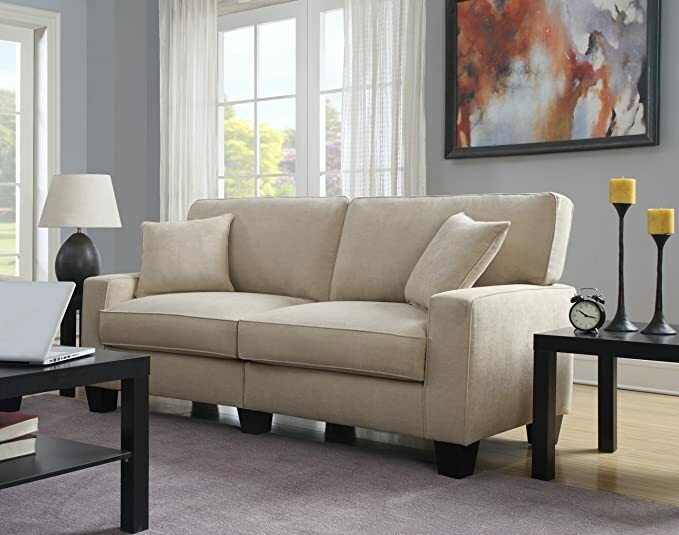 Created to suit small living spaces, the Serta Palisades Collection 77″ Sofa brings functional style and affordable comfort to your home decor. Its compact size and unique, tool-free assembly make it a great seating solution for apartments, offices and dorms. In addition to making small spaces feel larger, its straight arms, trendy fabrics and square espresso footers brings a modern flair to your living room, guestroom or home office. Quality hardwood materials deliver strength and stability while individually wrapped coils and pillowed back cushions offer a cozy, supportive seating you can relax back into. 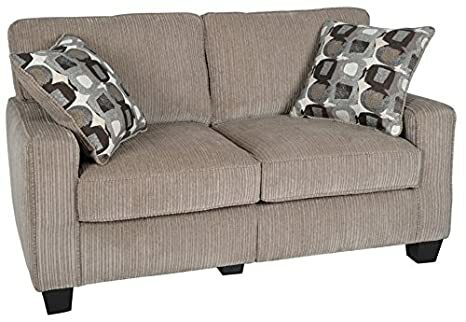 Designed to match pieces in the Palisades Collection, this Serta loveseat can be combined with another sofa, loveseat and accent chair for a completely coordinated look. 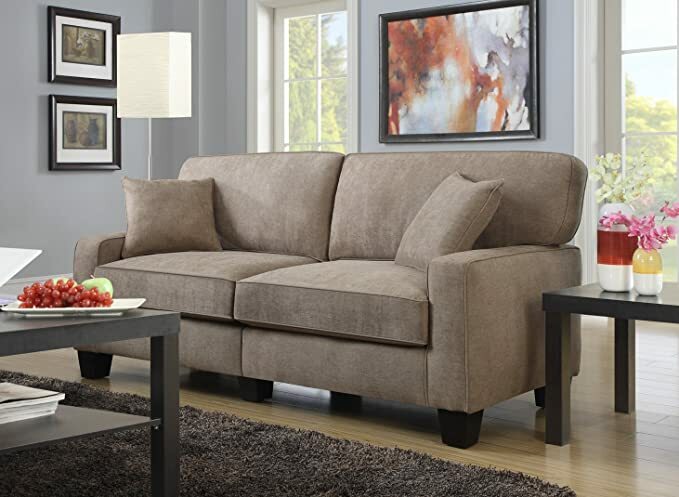 Created to suit small living spaces, the Serta Palisades Collection 78″ Sofa brings functional style and affordable comfort to your home decor. Its compact size and unique, tool-free assembly make it a great seating solution for apartments, offices and dorms. In addition to making small spaces feel larger, its straight arms, trendy fabrics and square espresso footers brings a modern flair to your living room, guestroom or home office. Quality hardwood materials deliver strength and stability while individually wrapped coils and pillowed back cushions offer a cozy, supportive seating you can relax back into. 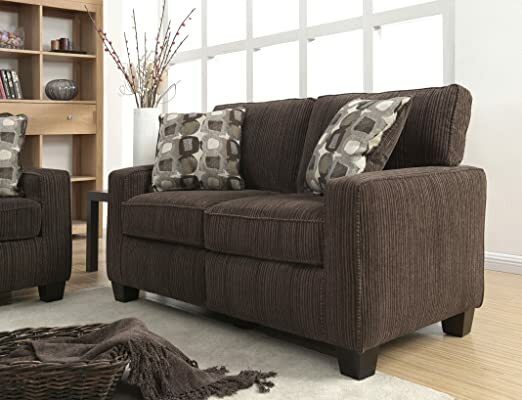 Designed to match pieces in the Palisades Collection, this Serta loveseat can be combined with another sofa, loveseat and accent chair for a completely coordinated look.